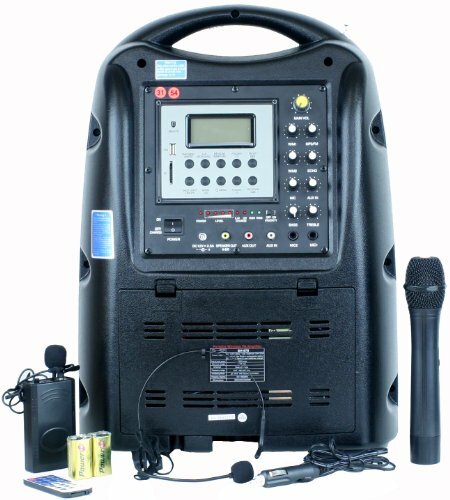 The Hisonic HS678 seamlessly combines a powerful 130 watts (maximum output power) speaker & a dual VHF wireless microphone system into one portable PA system. It has everything you need for your sound amplification applications. No assembly required! No extra equipment to purchase! Open the box, turn on the switch, put batteries in the microphones and switch them on, let the show begin!. The speaker comes with a long-life high-capacity rechargeable battery, suitable for outdoor activities where there's no access to a wall outlet. When the battery level is low, simply plug into a wall outlet with included power cord to charge it up again. The speaker can also be powered by the power cord if it's used indoor with access to electricity, a 12V/DC adapter (included) if it's used in a vehicle or even 10 pieces of D size batteries. The system comes with one handheld transmitter/microphone and one body-pack transmitter with different frequencies, and they can be used simultaneously without any interference. You also have the flexibility of choosing either a headset microphone or a lapel microphone to use with the belt-pack transmitter depending on your application. In addition, the system has additional microphone input jack if more microphones are needed. An audio input jack is available so you can play the music using the speaker by plugging in your CD player, cassette player or an MP3 player including ipod. What's more, this system also comes with both USB and SD Card reader, a fully featured MP3 player with remote control and a FM radio scanner. Dimensions: 20 ½ " x 15 ¼ " X 8 ¼ "
If you have any questions about this product by Hisonic, contact us by completing and submitting the form below. If you are looking for a specif part number, please include it with your message.